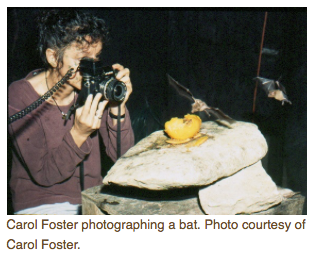 Wildlife filmmaker Carol Foster reveals her secrets for filming wildlife in a manner that captures natural actions in a manner that does not disturb the animals. She tells "The WildLife" host Laurel Neme, about the special jungle studio that she and her filmmaker husband, Richard Foster, have constructed in the Belize which allows them to film wild behavior that would not otherwise be possible. For instance, they've captured on film a baby cantil viper wriggling the green tip of its tail over its head to attract and capture frogs. They've also filmed flower mites hitchhiking on the nostrils of a hummingbird. You can download this and other episodes at Podbean or at iTunes. She specializes in bringing together diverse perspectives — from farmers and indigenous groups to high-level policymakers — to create positive solutions that protect wildlife while improving the livelihoods of those living near the animals.